As Winter approaches long walks from a metro stop to your destination is dreadful. 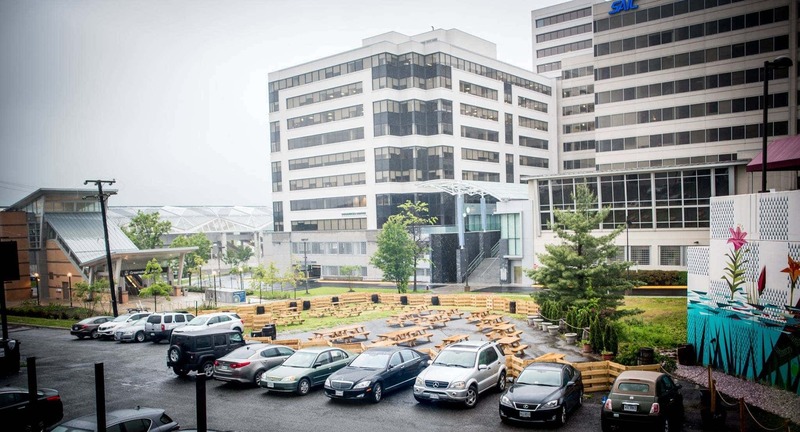 Good thing Tysons Biergarten is a mere 25 steps from the Greensboro metro stop! The Greensboro metro stop is off the Silver line which connects to all other lines through the many connection points. Hours of Operation: M-Thur: 5am – 11pm, F: 5am – 11pm, Sat: 7am – 11pm, and Sun: 7am – 11pm. Trains run frequently and once you have arrived you’ll be welcomed with a selection of 140+ types of beer, 50+ Whiskey/Bourbon/Scotch, three floors, a 10,000sq. ft. outdoor patio (with heaters), live music, outdoor games, and much more! With a metro stop that literally opens up to the biergarten, you won’t want to miss the stop! – after you’ve passed the metro ticket gate, turn left. – walk down the stairs to the outside. – you will immediately notice a big patio with a children’s play ground in front of you….THAT’S US! – turn slight right and follow the fence to the entrance of the Tyson’s Biergarten. – relax, enjoy and have fun! !